Looking for insect themed Pre-K centers? Kindergarten centers too? These are for you! Designed with both Pre-K and Kindergarten in mind, these centers will give you a variety of activities and options for your students. 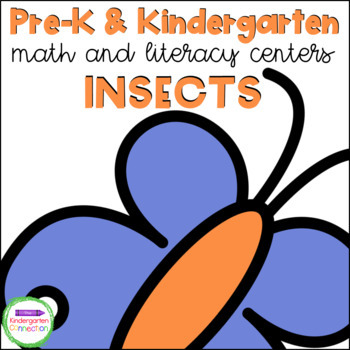 This pack is filled with engaging math and literacy centers for Pre-K and Kindergarten students with an insect theme (see the preview and description below for full details). ABC Clip Cards (2 levels) Clip the letter that matches the letter shown. (Uppercase to Uppercase matching, and Uppercase to Lowercase matching options). “A Little Insect” Emergent Reader (2 levels) - print a simple label style version, or one with a predictable sentence pattern. Copy two-sided and cut in half for two books! 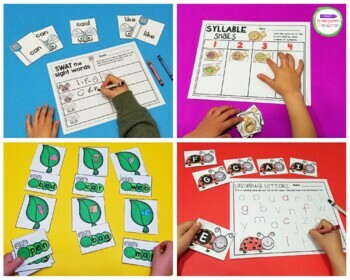 Syllable Snails - Sort the pictures on the snail’s shell by their number of syllables. Swat the Sight Words (Editable Version Included) – Match up the fly swatter sight words to their flies. Record some of the sight words you match! Insects Write It (Write the Room) – Pick a card (insect themed). Find and record the word next to its matching picture on the recording sheet. * Also includes a coloring version (no writing required, color the matching insect). Bug Spots Count and Clip - Count the spots on the bugs and clip the total. (sets to 20). Grasshopper Before and After - Clip the number that comes before or after in the series (numbers to 20). Insect Roll and Graph – Roll the die. Color a space above the insect you roll on the graph below. See which one gets to the top first! *Inserts included if you use your own plastic sleeve dice. Butterfly Base 10 – Pick a butterfly card and count the base 10 blocks. Color the butterfly with the matching number. Busy, Busy, Butterflies – Pick a card and count the butterflies. Color the butterfly with the total. 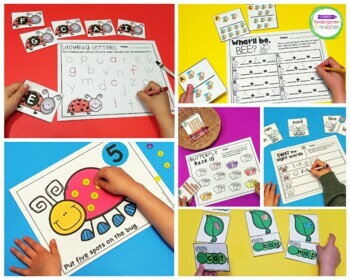 Caterpillar Count (2 levels) – Pick a caterpillar card and count the dots in the ten or twenty frame. Color the leaf that shows how many. What’ll Be, Bee? – Pick a card and count the bees on each side. Find the letter of that card and record the equation in the box. Bye-Bye Butterfly – Pick a card and solve the subtraction problem to show how many butterflies flew away. Find the letter of that card and record the subtraction problem. *2 versions – version 2 is pick a card, find and color the butterfly that shows how many are left (no equations). 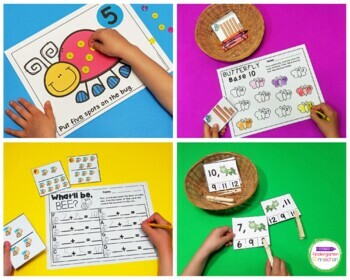 Bug Spot Counting Mats – Use playdough or other manipulatives as “spots” on the insect by reading the number or number words (numbers to 20). Bug Spot Addition and Subtraction Mats – Use play dough, buttons, or any other small manipulative as counters for “spots” to solve the addition and subtraction problems. Can laminate and use with dry erase markers. Black and White Copies of color items are included at the end of the file.